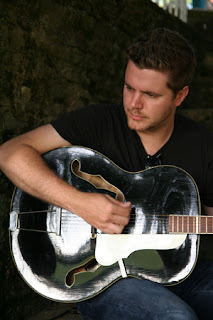 I was first introduced to the music of James Deane when I saw him performing with Mim Grey. He interacts amazingly well as part of a band, both with Mim Grey herself and with the rest of her band but you really see him come to life when he sings his own songs. James has such a haunting voice and the melodies in his songs really hold the attention of the listener. At the moment James has two EPs released and is working on his debut album. The title song of one of his EPs "Run Like A River" for instance, builds up beautifully. It starts with James, his guitar and a simple drum beat and simply by adding a harmonic vocal line and another guitar James succeeds in making the chorus of the song seem so much different in such a simple way. The majority of James' songs have quite a simple melodic line but that just serves to add to his appeal. It is easy for people to be able to relate to the subject matters of James' songs and even though it's not clear if James has lived through what he sings about but as an audience you certainly believe every word James sings and his a very believable performer. Not much is known about James as a person but this lack o information just serves to add to his draw. I can't wait to see the release of James' debut album - five star performer!